The deep social transformations occurred in the last decades have deeply affected the patterns of urban living. In this sense, experimentation on housing plays the dual role of investigation and validation of our hypothesis that residential space should reflect new life-styles. At the beginning of the 21st century, social housing represents the main field for experimentation. In the current architectural scenario, many interesting experimentations on contemporary housing can be observed. The approach proposed in this article starts with post-occupancy evaluation of some case-studies extracted from extensive research on European case-studies realized projects. It then analyzes the results of such evaluation to abstract issues concerning different aspects of contemporary living that could be coped at the design level. This method combines spatial and typological research, issues about housing and planning approaches developed by the promoters of the case-studies discussed. Providing quality social housing involves the coordination of multiple actors and synergies..
Fluency 1 is the most appropriate adjective to describe the structure of contemporary society. At this historic moment, every phase of our life expands and includes a multitude of stages. The acceleration imposed by the increased speed of information flows affects the concept of distance, job opportunities and the relationships between people. At the same time, the mixture of different cultures leads, on the one hand, to the transformation of lifestyles and, on the other, to the search for common values. Utlimately, the return to the sharing economy as a form of cooperation is the sustainable response to the current economic crisis. In the described background, people experience the continuous evolution of their aspirations and needs, which they face mostly through their intelligence and ability to adapt to new situations. The definition of fluency is applicable both to new lifestyles and to different groups of people living together. The latter are the signal of a changing society in which the main social unit is not anymore solely ascribable to the traditional family. Nevertheless, fluency mostly occurs in standardized houses conceived during the first part of the twentieth century and still largely diffused in the contemporary urban residential scene. The great innovation process that characterized the first decades of the twentieth century started from the International Congresses of Modern Architecture (CIAM), 2 which discussed mass housing among other important issues. The origins of the debate are attributable to the transition towards an industrialized society and the consequent urbanization of a large segment of the population, who urgently required decent houses. Such origins can also be tracked back to a widespread change of values and the outbreak of new needs related to a different economic and environmental climate. The extended public residential estate, built in Italy in the second post-war period and throughout ‘70s, is mainly the result of the studies on housing models and typology conducted by the likes of Walter Gropius, Alexander Klein, Le Corbusier, Mart Stam, Hans Schmidt, Cornelis van Eesteren, and their dissemination through a standardized production process. Nowadays, the construction market largely offers a miserable reinterpretation of the layout solutions for the minimum dwelling developed at the end of the ‘20s. In light of what has been described, re-opening the debate on contemporary housing is therefore necessary. The profound social transformation befallen in the last two decades reveals itself in the multiple variations of living: the residential space should accompany part of the countless stages of our lives and represent the place where individuals and groups can express themselves and realize their desires. In this sense, the experimentation on housing plays the dual role of an investigation and validation tool for the expressed hypothesis and it is essential for the development of the research. At the beginning of this century, Social Housing is again one of the main fields of experimentation for architecture. Social Housing can be intended as an effective response to the increasing demand of housing, in terms of cost-effective dwellings that are capable of adapting to change and to interpret the several aspects of contemporary living. Currently, there are many interesting experimentations on contemporary housing, which have never been evaluated against their original set of goals. The analysis of a building, conducted during its use, offers the opportunity to evaluate the level of satisfaction perceived by the inhabitants and their responses to both the dwelling and the urban scale. The described process is essential to the implementation of new housing strategies, which will replace the obsolete typologies currently used. Looking at architecture through the dweller’s experience, as Giancarlo De Carlo did for his project in Sesto San Giovanni, 3 introduces, for instance, new considerations on the social function of galleries in housing projects, originally designed for horizontal distribution. Similarly, a study conducted among the inhabitants of the INA-Casa neighborhoods, 4 led to the definition of the ideal home plan. One of the internationally recognized systems for the assessment of buildings is the Post Occupancy Evaluation (POE) method. 5 The following research, investigating the contemporary forms of living, started from the analysis of a range of selected projects and evaluated the achievements of the architects’ purposes through an extensive on-site survey which involved the POE method. The design experimentation attempted by the different architects connects to a set of requests, selected through a preceding accurate analysis conducted on the differentiation of lifestyles and groups of users. The “need-experimental project” system is then evaluated through a questionnaire distributed among the inhabitants in the studied building and according to the Post Occupancy Evaluation method. The questionnaire is adjusted case by case according to different experimental issues. The recording of spontaneous observations made by the dwellers, as well as the examination of social and spatial dynamics, complement the survey. The role played by the inhabitants in experiencing the innovations introduced in the residential space represents the first important phase of a reconciliation process between the architect and the dweller, which rarely occurs in the current project practice and nevertheless is essential for the continuation of the research process. The analysis of the feedbacks contributes to the individuation of the most recent developments in housing experimentation and indicates possible improvements for a successful application of the studied approach in a different context. SITE’s project for New York, “Highrise of Homes” (1981), 6 generates a utopic image that symbolizes the diffused desire for a house embodying the characteristics of a villa (differentiation, external private areas and intimacy) and the peculiarities of a multi-storey building (security, services and sociability). This theme is infrequent in contemporary architecture, possibly due to the complexity of combining such different requests. 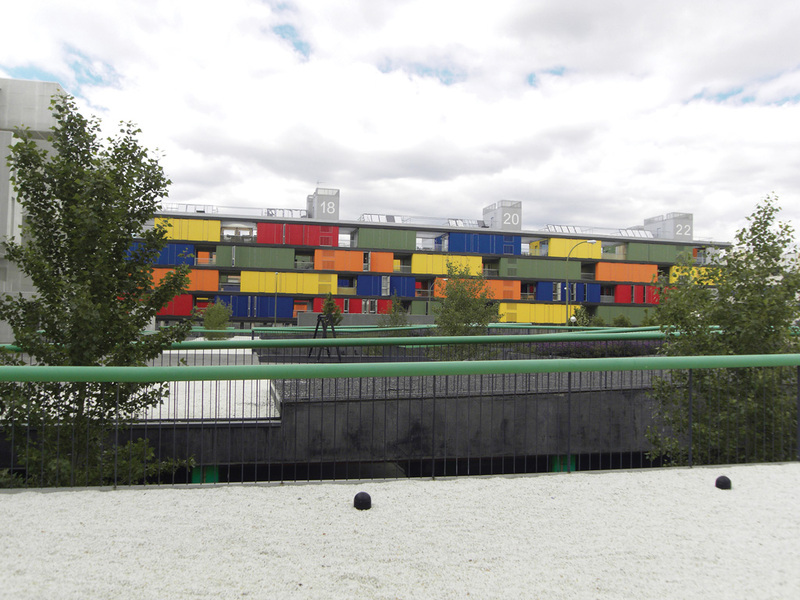 The social housing complex Carabanchel 17 in Madrid (2009), designed by ACM Arquitectos responds in part to the listed needs (Fig. 1). ACM Arquitectos, Carabanchel 17, Madrid, 2009. Courtyard view of the housing block. 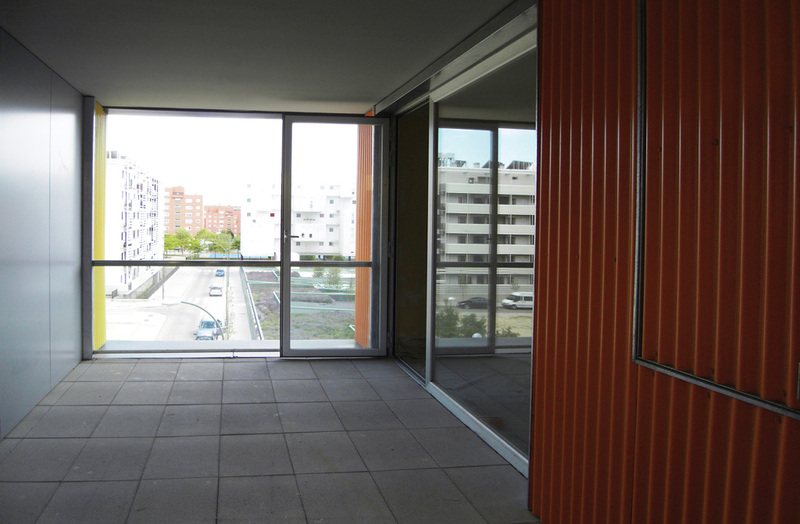 Especially in Carabanchel 17, due to the introduced innovation regarding differentiation, building materials and external common and private areas, the interaction of the different aspects involved was crucial to accomplishing the expectations of the inhabitants. The problems revealed by the questionnaires are not only attributable to the project but also to the planning process. The beneficiary families - identified through a selection procedure among the waiting lists of the Municipality of Madrid - originally submitted applications to the buyers program. The materials chosen for the projects were associated with the idea of a temporary and precarious state, contrasting with the “house-for-life” common aspiration of the traditional family. However, once the family was selected, the rejection would entail the loss of the acquired rights and the entrance into a new process. The same dwellings - allocated to students or young workers for short or medium term rental - would probably achieve a higher degree of satisfaction. The statements of the dwellers do not imply the failure of the experimentation but the absence of the preconditions for its success (Fig. 2). The methodological approach applied to Carabanchel 17 and to a number of European case-studies has led to the definition of various common research issues about housing. It appears that the higher the satisfaction for the dwelling and the surrounding area, the easier is the identification of the inhabitants with the housing complex. 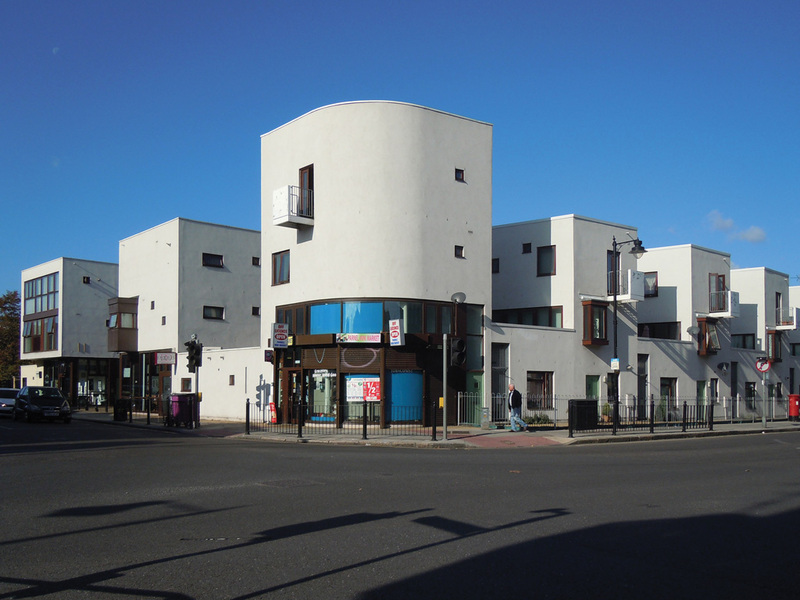 This consideration emerged from a set of questionnaires distributed among the inhabitants of the Donnybrook Quarter, realized in London by Peter Barber Architects Studio (2001-06), and of Umbrete near Seville, Spain (2002-08), designed by Solinas Serra Architects (SSA). It can be stated that when needs are correctly interpreted, a unique and recognizable image can be perceived as an additional value also in social housing, rather than as an instance of marginalization (Fig. 3) (Fig. 4). Peter Barber Architects Studio, Donnybrook Quarter, London, 2001-06. 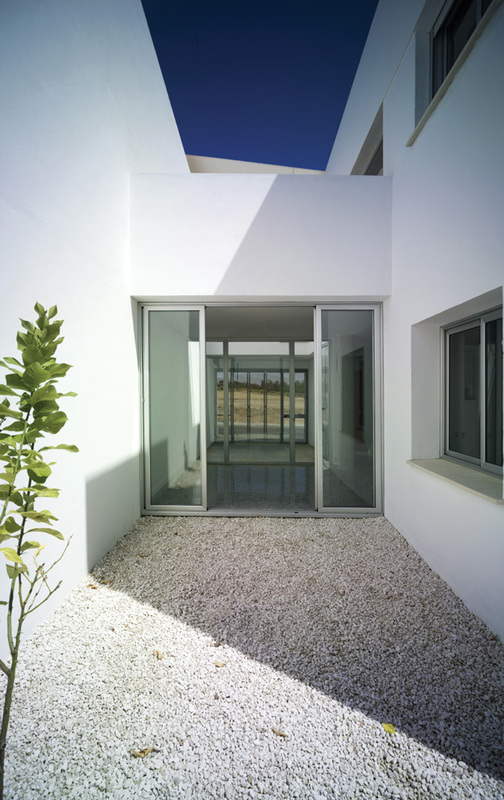 Solinas Serra Architects (SSA), Umbrete, Seville (Sp. ), 2002-08. (Photo by Jesus Granada, Courtesy of SSA). These two interventions differently inflect the transition among private, semi-private and public space and organize the adjacent external space. In Umbrete, the succession of patios reminds of a sequence of theater wings and leads to the intimate core of a traditional Sevillian domestic space, whereas in Donnybrook the pedestrian area completes the urban scenario with a relational space (Fig. 5), (Fig. 6). In both projects, the inhabitants look at the open area as an additional element, in contrast to the attitude observed among the dwellers of Carabanchel 17, where the small size of the apartments - decided by the promoter (EMVS) 7 - alongside some design qualities, downgraded the terraces to unexploited surfaces subtracted from the house (Fig. 7). Another issue comes from the absence of regulation and management of the common external courtyard, which led to its decline. The same problem was noticed in those situations suffering from the lack of an orientation program and an intervention of the social housing manager 8 aimed at facilitating cooperation and joint regulation. Umbrete. The sequence of inner patios. (Photo by Jesus Granada, Courtesy of SSA). Donnybrook Quarter. View from the internal pedestrian path. Carabanchel 17. Every dwelling is provided with a private terrace. A residential building can be said to respond to the definition of service, effectively equipped and organized through shared rules, which allow practices aligned with the original objectives defined by the architect or the social housing manager. It does not represent a mere addition of apartments, but is the place for social life, connecting activities and spaces designed for the different forms of association. The project of the activities, belonging to the housing complex and their physical space, as well as the design of the common areas, should consider the real future users: not only the very residents but also the community inhabiting the immediate surroundings. 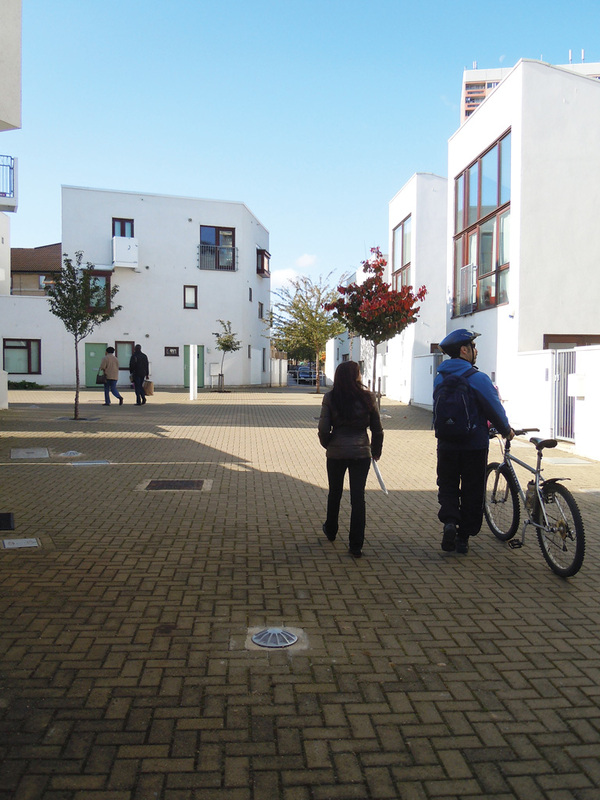 The context of the intervention, mostly suburban, affects the type of collective services located inside the housing block, which complement the ones already existing in the area. In the case of the requalification of a building in the historic fabric, the substantial quantity of collective services already in place in the area will save resources, which may be invested in the implementation of nearby facilities. The analysis of the context allows also design solutions that would otherwise be considered undesirable. 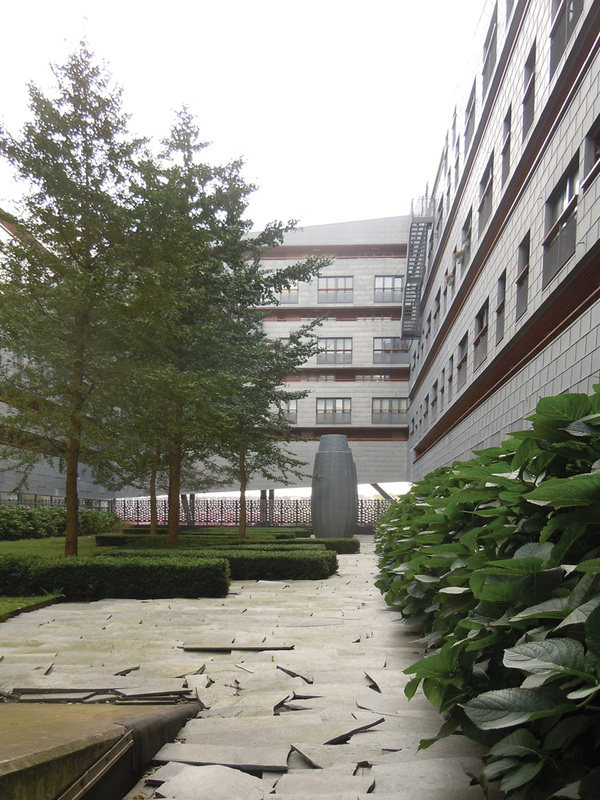 For instance, in “The Whale” housing complex, designed in Amsterdam by The Arkitekten Cie (1995-2000), the inner courtyard is a green area of extreme quality accessible only for maintenance. The inhabitants appreciate this space, intended as an art installation adjacent to the private balconies, because it does not compete with the nearby park (Fig. 8), (Fig. 9). 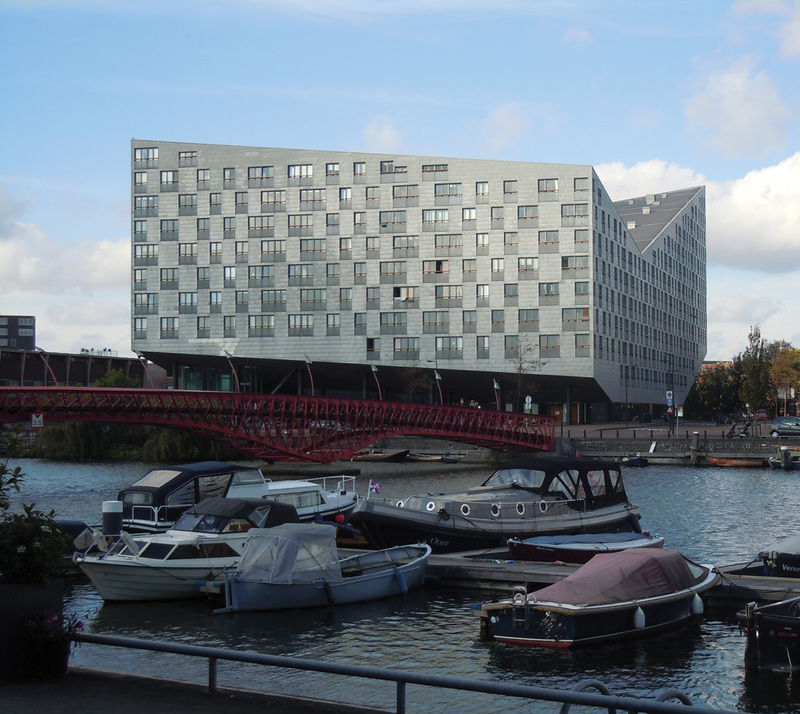 The Arkitekten Cie (chief designer Frits van Dongen), “The Whale” housing complex, Amsterdam, 1995—2000. The Whale complex. View from the internal courtyard. The described approach, implemented through an extensive research on European case-studies, selected among the most recent social housing realizations, starts from Post-Occupancy Evaluation, analyzes their results and abstracts project issues concerning different aspects of contemporary living. This method keeps together various domains such as spatial and typological research, the evolution of housing, and planning procedures that make use of participatory practices to achieve an accurate definition of needs. The current housing demand does not solicit a quantitative response: the construction of new buildings or the reconversion of the existing ones into residential space nourishes a situation of obsolescence and discontent. 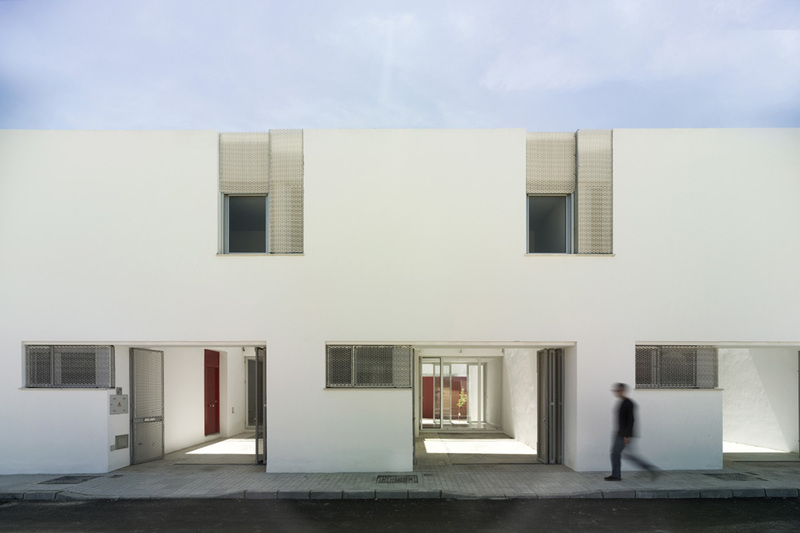 Providing quality social housing entails the coordination of multiple actors and synergies. It definitely requires an adequate individuation of the beneficiaries of programs and interventions by the promoters alongside the definition of long-term plans by the social housing managers. It also necessitates architects to design projects that respond to the multifaceted forms of contemporary living and are capable of allowing change through the course of time. Finally, it needs an accurate evaluation of priorities and investments by the local administrations. A new vision on contemporary housing based on a critical revisioning of existing case-studies is crucial to the definition of a joint strategy for a sustainable, socially viable and spatially qualitative development of our cities. This article was awarded Honorable Mention at the 2015 THE PLAN Best Paper Award contest. – Ed. Cf. Zygmunt Bauman, Liquid Times: Living in an Age of Uncertainty (Cambridge, UK: Polity, 2006). The debate on the minimum dwelling was the central issue of many CIAM meetings, especially in their early years. Some of the most important members of the architectural avant-garde built a large number of siedlungen (German for “settlements” or “new neighborhoods”) in Germany during the Weimar Republic. Le Corbusier, Walter Gropius, Ludwig Mies van der Rohe, Hans Sharoun and Bruno Taut, among other architects, exposed their housing models in 1925 at the Exposition Internationale des Arts Décoratifs et Industriels Modernes in Paris and later at the Weissenhofsiedlung, in Stuttgart (Ger.). Giancarlo De Carlo, INA-Casa, Sesto San Giovanni, 1950-51. The investigation carried by the architect highlighted the role of the balconies as social space that is used by the worker/inhabitants to build relationships within their neighborhood. The terraces at the back of the scheme have never been used for the same purpose, contrary to what had been intended by the project. The INA-Casa plan was a public housing program in Italy, funded by the government, developed in two consecutive plans, 1949-56 and 1956-63. Implemented in great diversity of situations and urban contexts, it achieved a varied level of success, but it involved some of the most prominent Italian architects of the second post-war period, such as Mario Ridolfi, Carlo Aymonino, Franco Albini, Ignazio Gardella and the BBPR. – Ed. Preiser (1988), defines Post Occupancy Evaluation as the process of evaluating buildings in a systematic and rigorous manner after they have been built and occupied for some time. POE has its origins in the United States in the 1960s and usually includes a mix of quantitative and qualitative techniques. The concept of “Highrise of Homes” was introduced by the group SITE with a mock-up of building in Battery Park, New York. See http://www.siteenvirodesign.com/content/high-rise-homes [accessed on June 16, 2016]. According to Klaus-Dieter Weib’s essay, included in the book Alta Densità Abitativa - inDetail (Basel, Switz. : Birkhäuser Verlag AG, 2005), it represents the connection of the two living models which embody dream and reality, and is perceived by citizens as utopia. For this reason, it does not generate a specific need. The plan developed in Madrid by EMVS, Empresa Municipal de la Vivienda y Suelo, is part of the transformation process that this city has experienced between 2003 and 2011 with the construction of almost 59,000 new homes under different forms of public protection (among these are 32,500 VPO - vivienda de protecion official). The expression “social housing manager” refers to the Italian “gestore sociale” and designates the administrator of the social housing agency, owning the intervention: a municipality, a regional or national institution or a private company. 12 Concursos de Arquitectura. I-VII vols. Madrid: EMVS, 2000. Abalos, Iñaki. La buena vida. Visita guiada a las casas de la modernidad. Barcelona: GG, 2000. Aymonino, Carlo, ed. L’abitazione razionale. Atti dei congressi C.I.A.M. 1929-1930. Padua, It: Marsilio, 1971. Amendola, Giandomenico. Il progettista riflessivo. Scienze sociali e progettazione architettonica. Rome: Laterza, 2009. Augé, Marc, ed. Non Luoghi. Introduzione ad una antropologia della modernità. Milan: Eleuthera, 2005. Baffa Rivolta, Matilde and Augusto Rossari, ed. Alexander Klein. Lo studio delle piante e la progettazione degli alloggi minimi: scritti e progetti dal 1906 al 1957. Milan: Mazzotta, 1975. Bauman, Zygmunt. Liquid Times: Living in an Age of Uncertainty. Cambridge, UK: Polity, 2006. Beretta Anguissola, Luigi. I 14 anni del piano INA-Casa. Rome: Staderini, 1963. Biondo, Giuseppe, Carlo Monti, Riccardo Roda and Maria Rosa Ronzoni, ed. Abitare il futuro. Città, quartieri, case. Milan: BE-MA, 2005. Boesiger, Willy, and Hans Girsberger. Le Corbusier 1910-65. Bologna: Zanichelli, 1987. Bretagnin, Mauro, and Edo Pietrogrande. Salubrità dell’abitare. All’origine dell’approccio, ecosostenibile nell’architettura del moderno in Germania ed in Italia. Monfalcone, It. : Edicon, 2002. Chenut, Daniel. Ipotesi per un habitat contemporaneo. Milan: Mondadori, 1968. Colomina, Beatriz. Domesticity at War. Barcelona: Actar, 2006. De Licio, Luciano, ed. La dimensione urbana della residenza. Rome: Kappa, 2003. Di Biagi, Paola, ed., La grande ricostruzione. Il piano Ina-Casa e l’Italia degli anni ’50. Rome: Donzelli, 2001. Garofalo, Francesco, ed. L’Italia cerca casa. Verona, It. : Electa, 2008. Gelsomino, Luisella, and Ottorino Marinoni, ed. Territori europei dell’abitare. 1990-2010. Bologna, It. : Compositori, 2009. Giordano, Giovanna. La casa vissuta: percorsi e dinamiche dell’abitare. Milan: Giuffrè, 1997. Griffini, Enrico A. Costruzione razionale della casa. Milan: Hoepli, 1931. Grisotti, Marcello. Residenze flessibili. Progettazione spaziale e tecnologica. Bologna, It. : Esculapio, 1996. Galfetti, Gustau G. Células domesticas experimentales. Barcelona: GG, 1997. La Cecla, Franco. Mente Locale: per un’antropologia dell’abitare. Milan: Elèuthera, 1993. Lucan, Jacques, ed. Le Corbusier: une encyclopédie. Paris: Éditions du Centre Pompidou, 1987. Malighetti, Laura E. Progettare la flessibilità. Tipologia e tecnologia per la residenza. Milan: Clup, 2000. ----- L’alloggio trasformabile. Strumenti per la progettazione dell’edificio residenziale. Milan: Clup, 2002. Mostaedi, Arian. Flexible Homes. Barcelona: Links, 2006. Moya, Luis, ed. Vivienda Reducida. Madrid: Mairea Libros, 2007. Norberg-Schultz, Christian. L’abitare. L’insediamento, lo spazio urbano, la casa. Milan: Electa, 1984. Preiser, Wolfgang F. E., Harvey Z. Rabinowitz, and Edward T. White. Post Occupancy Evaluation. New York: Van Nostrand Reinhold, 1988. Rizzi, Roberto, ed. Civiltà dell’abitare. L’evoluzione degli interni domestici europei. Milan: Lybra, 2003. Samonà, Giuseppe. La casa popolare degli anni ’30. Venice, It. : Marsilio, 1972. Schittich, Christian, ed. Alta densità abitativa. Idee, Progetti, Realizzazioni. Munich: Detail, 2005. ----- Housing for People of All Ages. Flexible, Unrestricted, Senior-Friendly. Munich: Detail, 2007. Schneider, Friederike. Atlante delle piante degli edifici. Turin: Utet, 2000. Schneider, Tatjana and Jeremy Till. Flexible Housing. Oxford, UK: Elsevier, 2007. Segantini, Maria A., ed. Atlante dell’abitare contemporaneo. Milan: Skira, 2008. Turchini, Giovanni and Manuela Grecchi. Nuovi modelli per l’abitare. Milan: Il Sole 24 Ore, 2006. Turner, John F. C. Housing by People: Towards Building Environment. London: Boyards, 1976. Some of the issues developed in the present article have derived from the research project “L’abitazione sociale contemporanea. Analisi, valutazione critica, proposta operativa” developed by Romina Marvaldi and Elisabetta Pani, carried out from 2010 to 2012. The research was financed by PO Sardegna FSE 2007-2013 founds on L.R.7/2007 “Promozione della ricerca scientifica e dell’innovazione tecnologica in Sardegna”. All photos, except for photos 4 and 5, are by the Authors. “SoHousing” founders, Marvaldi and Pani authored a number of articles on housing and new living models. From 2004 to 2014 they taught at the University of Cagliari, taking part in several workshops as project coordinators. 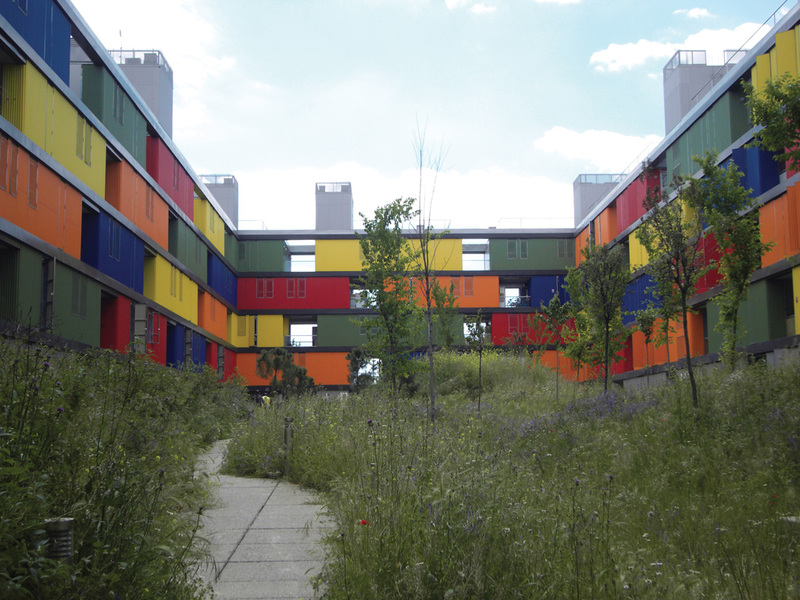 From 2010 to 2012 they developed the research project “Contemporary Social Housing. Analysis, Critical Evaluation, and Operational Proposal,” financed by the regional government of Sardinia, and conceived as a deep investigation on European social housing. They have been Lecturers at the University of Cagliari from 2011 to 2014 where they led the “LabSoHousing” course for final Master theses in architecture. The topic of housing has been further explored also through entering architectural competitions.